Just as I was about to pull up these weeds in my school berry patch this little guy landed. He made me ponder the quote above. It was part of a Northwest Institute Course I have been taking with 6 other stalwart people on Wednesdays nights at church. The course, called Discovering a Sense of Place, has helped me understand a bit more about my relationship to Middle Tennessee. It caused me to pause. 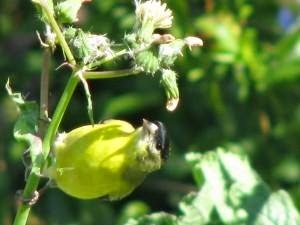 Should I pull the thistle up because it is my right to have a beautifully manicured garden or should I leave it for my beautiful Goldfinch friends as one of their primary food sources? I know what my native American friends would have done. They left most of the natural world as they found it.